I’m spending more time with my double pencil drawings, I’ve even done some further cafe sketches because the lines seem fresh once more. 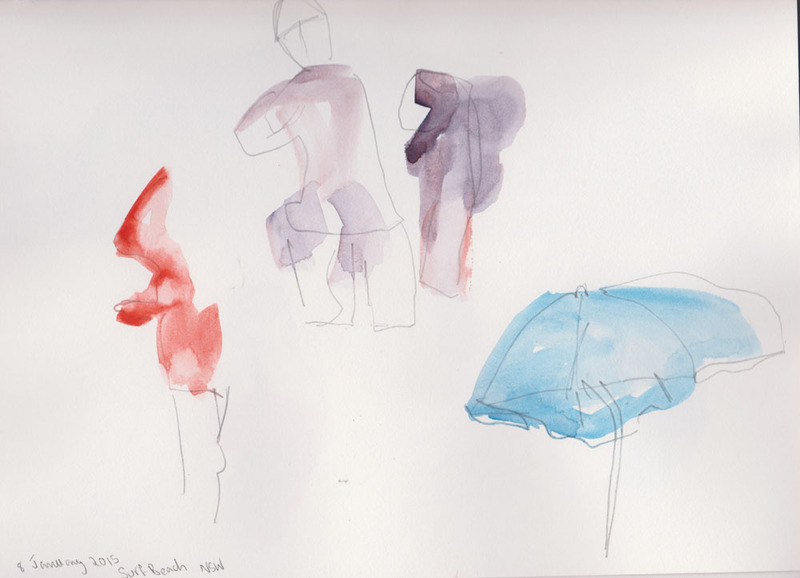 With these drawing I drew focusing on working from the centre out, as the project method asks. When I was at the library yesterday I found two drawing books that looked interesting. 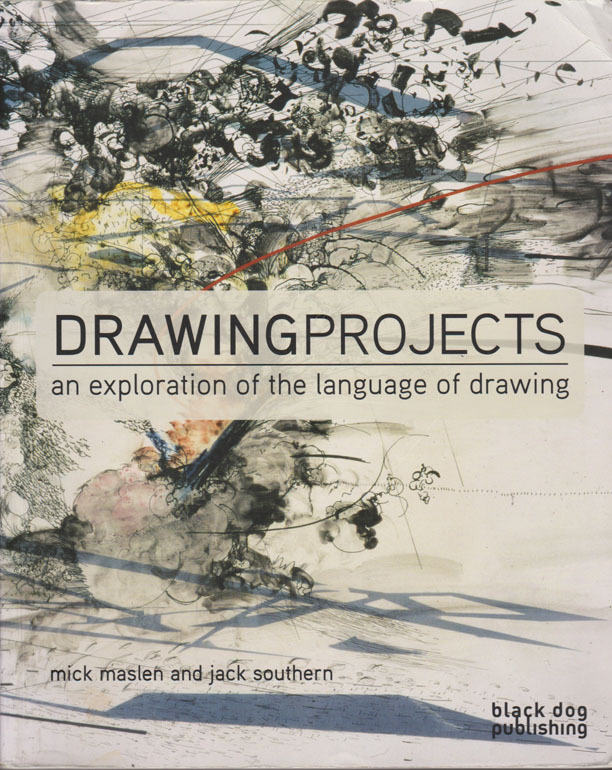 The one I want to touch on today is Drawing Projects: an exploration of the language of drawing, by Mick Maslen and Jack Southern (Black Dog Publishing 2011). A quick first look through the book had me very excited. The book covers a wide range of drawing styles and suggests a variety of approaches to developing your own drawing techniques. Between reading the introductory sections, looking at the artist profiles and trying out the suggested projects I know that I won’t be able to take it all in within the loan period, so I’ve ordered a copy of my own. I was immediately inspired to try the first project, drawing with two pens. The idea is to bind two pencils (of different hardness) together and with them draw a single object/person/self-portrait. I admit that I went pretty much to my own version of the project rather than following the method precisely. This meant that I missed out on one of the prime aims of this project which is to get you making marks on the inside of the form and break the habit of “using line to draw the outer contour line first.” I did at least manage the other purpose of the exercise, to wit, making interesting and varied marks. 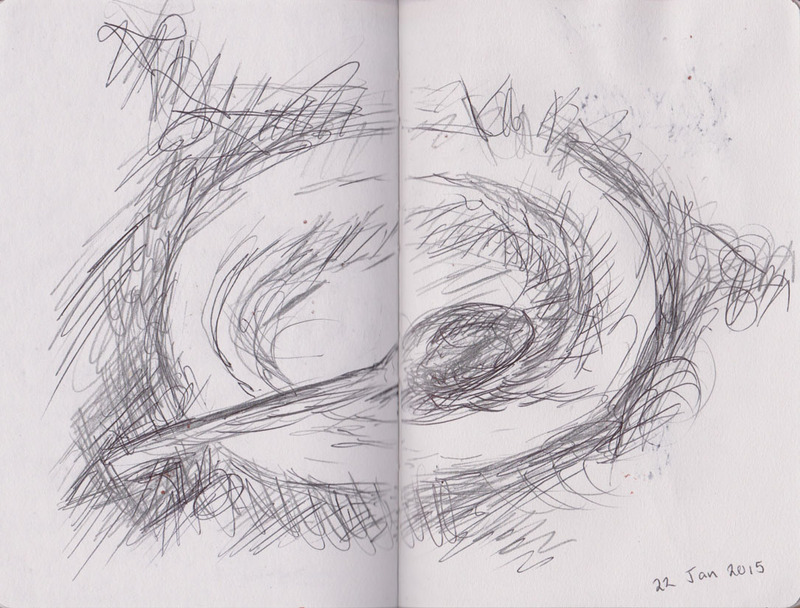 My first drawing was made with my Lamy Safari pen and a ballpoint pen that was just lying around, bound together. I’m mentioning the size of the drawings because the book suggests that you limit this project to something no bigger than 30 cm. My initial reaction is that I would like to use this technique on a much larger scale where I think that the lines would be very beautiful, while the technique would be less obvious from a distance away. At this smaller scale it seems to easy to lose sight of your subject. 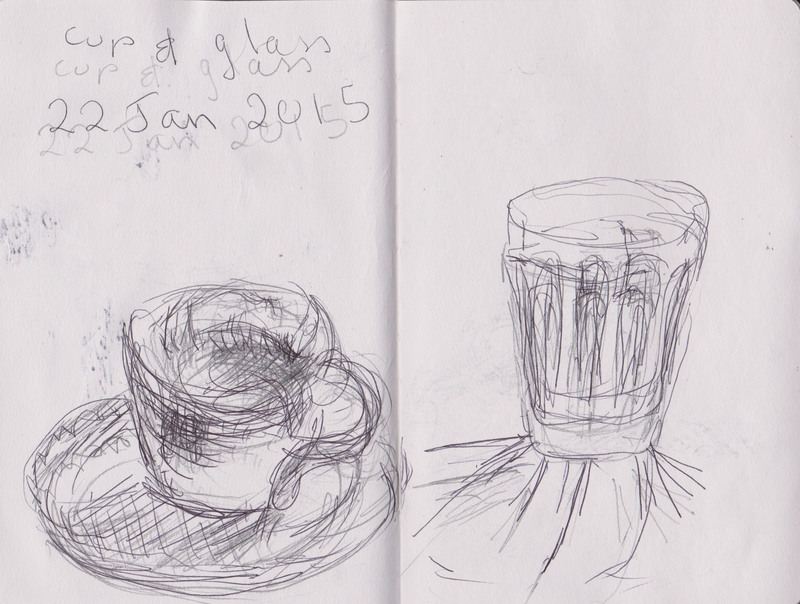 I had so much fun with the first drawing that I decided to use the same approach when I was at the cafe this morning. This time I used my Copic Multiliner and a Pitt Artist pen (Sanguine 188), held together in my hand as I had nothing to bind them with. 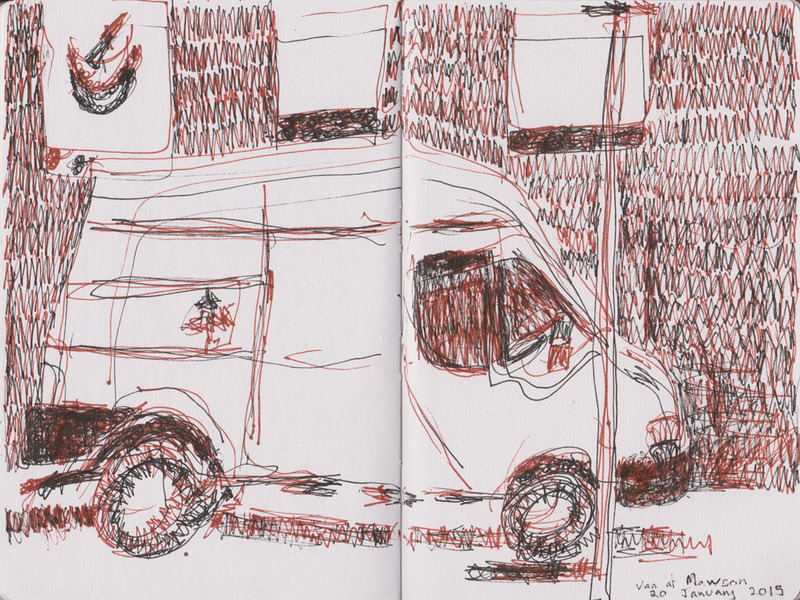 What stands out for me in this drawing are the lovely loose lines in the body of the van. While I’ve achieved a good contrast between the van and the background, the background marks are all a bit same-y. It may have been a more interesting drawing if I varied those marks a bit more. 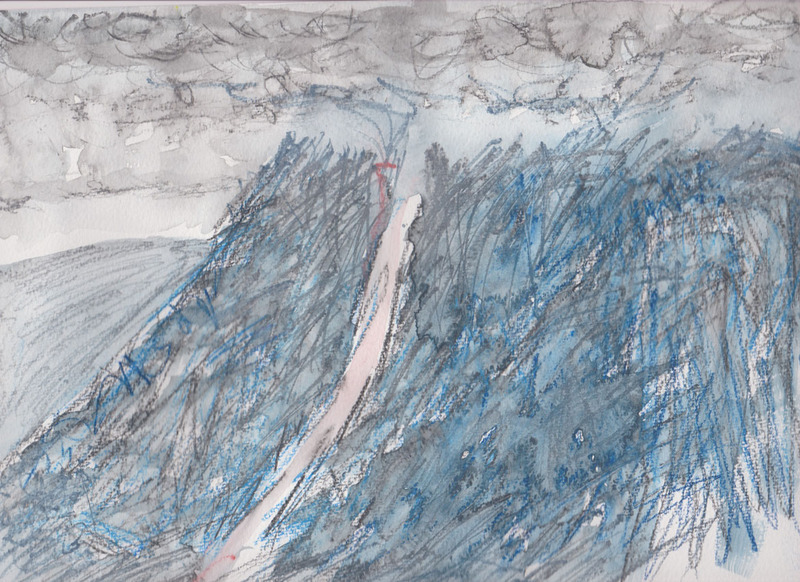 I couldn’t resist yet another drawing when, on my way home, I saw nearby Mt Tennant, with a cap of low cloud over it’s peak and the scar from the landslide in 2012, still visible. I chose to use two watercolour pencils held together. 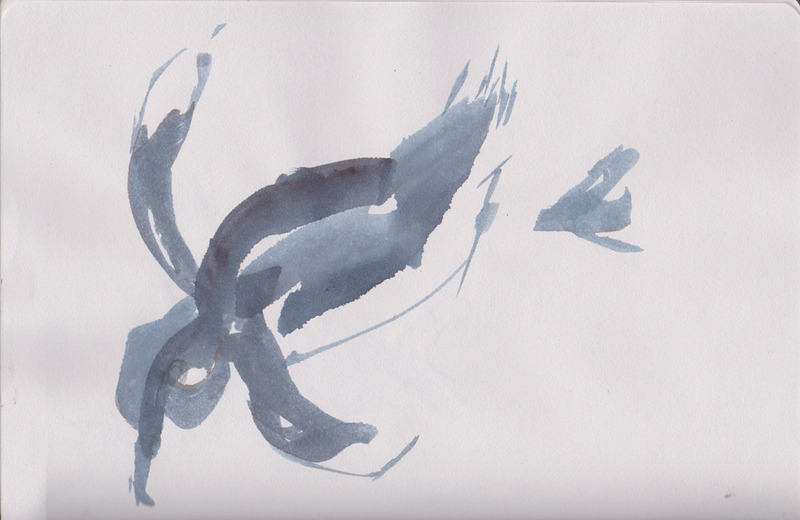 I varied the colours, between Faber-Castell Cold Grey V-234 and Cool Grey VI-235 with Derwent Watercolour Prussian Blue 35, Blue Grey 68 and Rexel Cumberland Derwent watercolour 17. I think this last drawing is the least successful of the three, perhaps because the marks I made were too similar in style and lacked the contrast of the previous drawings, where I used two different types of pens. See I’m learning already. So says crime writer Catherine Aird and last week’s sketch outing was a fine vindication of this thought. It started out well enough, we went to the newly completed Beijing Garden, a gift from Canberra’s sister city, in honour of Canberra’s centenary. The garden is located on the shore of Lake Burley Griffin, behind the Hyatt Hotel. The garden packs in quite a bit of cultural and gardening history in a relatively small area. There are buildings, numerous sculptures and rocks, so there’s lots to draw. I was intrigued by a view which I could see from the road, where the tea house is partly obscured by the sloping ground. I found a similar position closer to the tea house and started to put in my pencil guides. The fact that I took a while and several attempts to get this much should have indicated that I needed to re-consider what I included in the composition. But who am I to listen to common sense. I ploughed on into the watercolours and started to make some headway into what I soon realised was a deceptively complex set of columns. By this stage my inner me was frantically signalling that I should perhaps quit while I was ahead, after all I’d done an OK job of getting those columns more or less in place. Why not consolidate what I’d already captured or move on to a new composition all together? Maybe next time I’ll listen to myself. But I couldn’t leave it alone and started in on the roof instead. Oh no, it soon dawned on me that I had all sorts of problems here, not the least of which was getting the angles and placement right. There was also the issue of colour. The very strong gold and emerald colours of the glazed tiles actually do sit very strangely with the exceptionally light grey colour of the stone columns. This is something I could have artistically bodged up, but by this stage I just couldn’t manage it. Oh dear, if at first you don’t succeed! watercolour 13 January 2015. At least the others had the sense to draw something else and were way more successful in their outcomes. 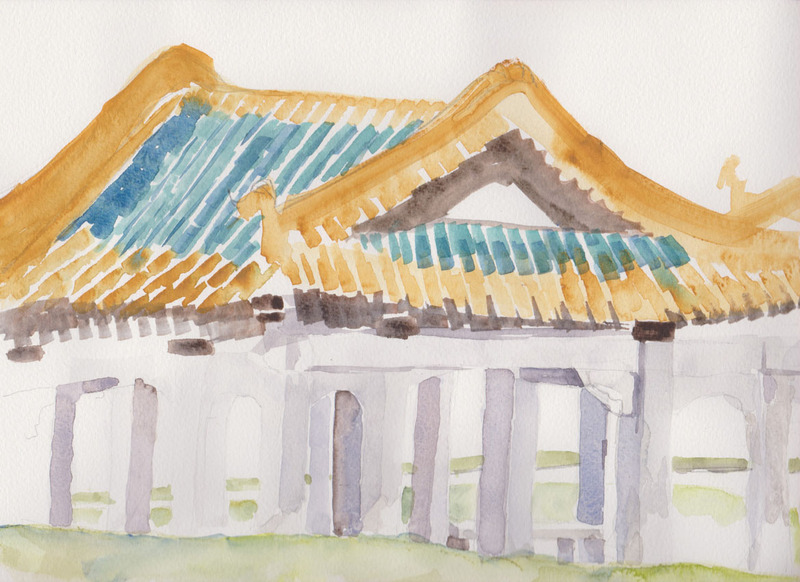 The Beijing Garden is now definitely on the re-visit list and hopefully I will have learned something from this experience. If nothing else I did get a laugh from this sign. 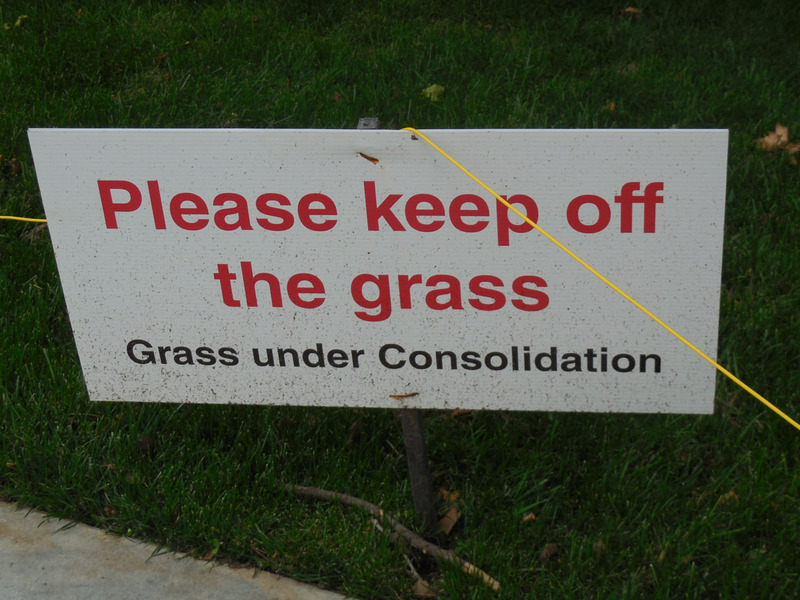 Next time I can manage some consolidation of my own. No rest for the wicked. Today’s outing was to the National Zoo and Aquarium, which I’m rather embarrassed to admit that I had never visited in all my years of living in this city. 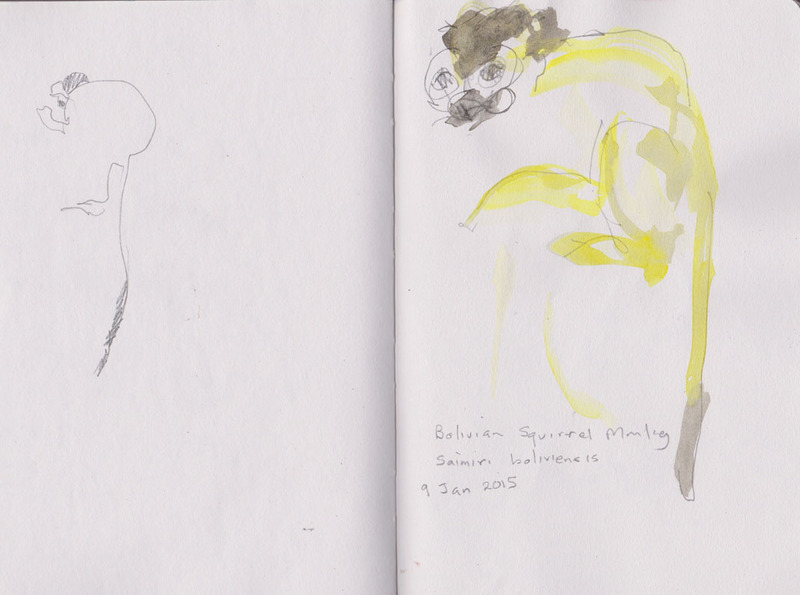 We went armed with sketchbooks and plenty of enthusiasm to try and draw some of the animals we saw. 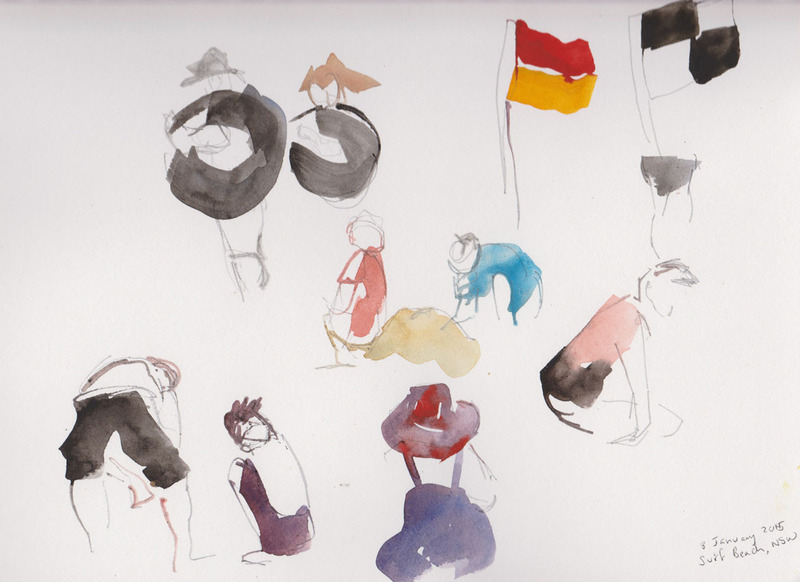 After having a lot of fun with the quick watercolour sketch at the beach I thought that it was probably a good approach to try with the animals, which I assumed would be unlikely to be sitting still for very long. At first we wondered whether there were any animals to see. The Snow Leopards were hiding so effectively that no one could spot them and ditto for the next few cages we looked into. At least we did see the recently arrived hyenas. The Black Capuchins (Sapajus nigritus) were more obliging and after a false start so too were the Bolivian Squirrel Monkeys (Saimiri boliviensis), who decided to come out for a play. I’d never seen a yellow monkey before! And yes, the colour I’ve used in my drawing is a close match for their fur. They are quite small, extremely agile and quite entrancing to watch. We decided to keep moving. On to the White lions and then the Sumatran Tigers. We were watching the female Sumatran Tiger, who is at the zoo with a view to a future mating with the male in the cage next to hers. We saw her walking back and forth in the one spot, never a good sign for a captive animal, until we realised she could see two small children who were playing on the nearby path! Once the parents had collected the children, oblivious to the tiger’s interest, the tiger moved off quite happily to other parts of her large enclosure. I was also quite excited, although that’s probably not the best way of expressing it, to see the tiger scent-marking one of the trees in her area. 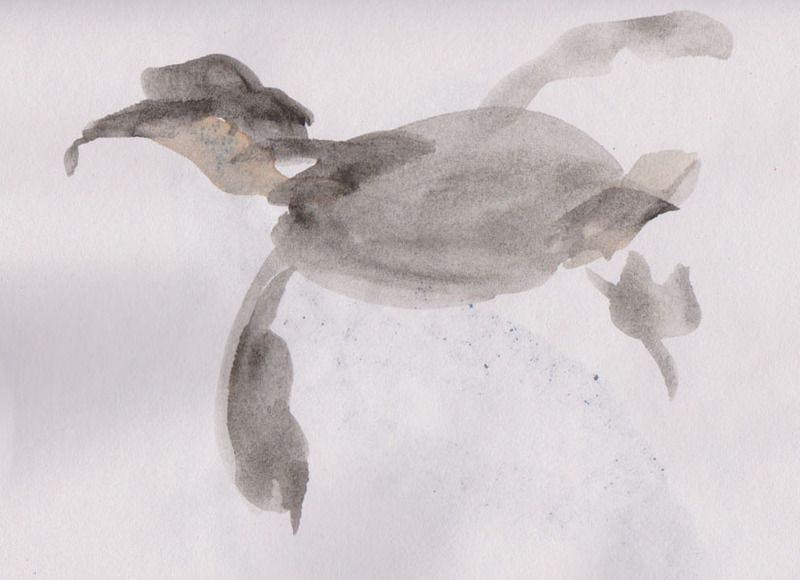 Moving from the large and back to the small we stopped to draw the Little Penguins. The little penguin (Eudyptula minor) is the smallest species of penguin growing to an average of 33 cm (13 in) in height and 43 cm (17 in) in length. Apparently it’s no longer ‘kosher’ to call them Fairy Penguins, which is how I always knew them as a child. Their long, very clear pool, is built so you can lean right over to see them rocketing up and down its length. Great for drawing! The other feature of these birds, just to pick one, is their colouring, which up close is distinctively a deep slatey-blue, hence yet another common name for them as the Blue Penguin. This particular animal had a white patch on the end of both it’s flippers and a whitish head. Near the penguins were another animal I find quite fascinating, the Goodfellows Tree Kangaroo (Dendrolagus goodfellowi). It seems like a contradiction in terms but these are basically tree dwelling kangaroos. This species comes from the New Guinea rainforests, as do the majority of these odd-looking beasts. To combat the heat of the day their pens had very fine sprays of water, which also cooled the air for passing visitors. 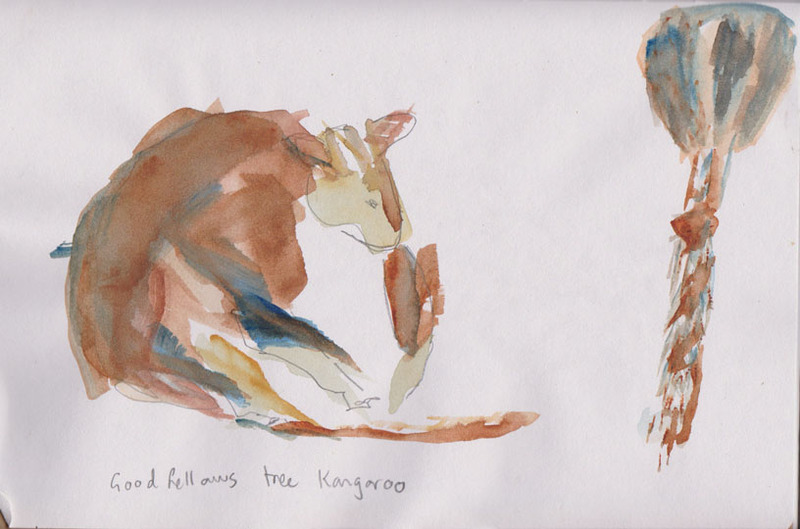 The first animal I drew was sitting inside a hutch, up a pole, along with another Tree Kangaroo, with it’s back resting along one wall. In this case there is a discrepancy in the colours I’ve used. While the majority of the fur is chestnut red, with paler yellow ochre areas, I didn’t have the intense dark brown that characterised the darker areas on the animal’s forearms and legs and the wide stripe down its back. When the animal moved I took the opportunity to try for a tail sketch. Again its a combination of the chestnut and pale ochre in a blotchy sort of pattern. 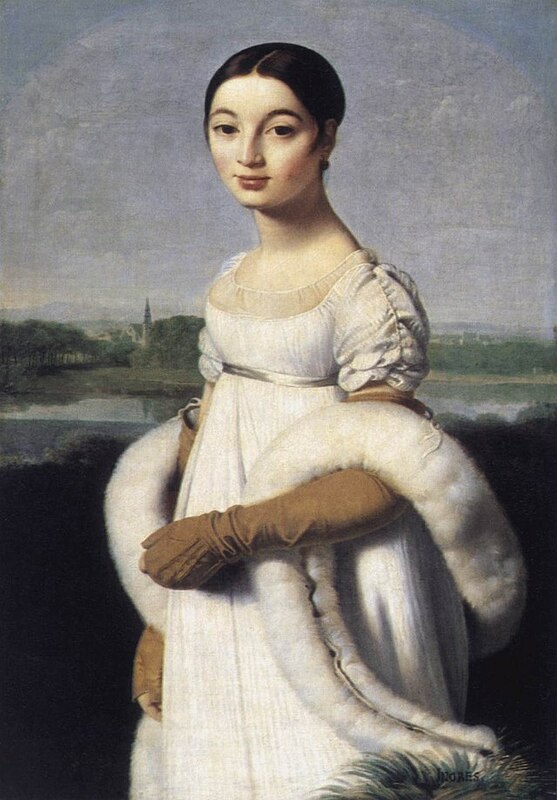 I really need to work out how to get the texture of the tail fur, which reminded me of the fur wrap in Ingres painting of Mademoiselle Caroline Riviere. Moving on to another elegant neck, my final sketching subject of the day was the zoo’s Giraffe (Giraffa camelopardalis), who was temporarily under house arrest while waiting for some training by the keepers. 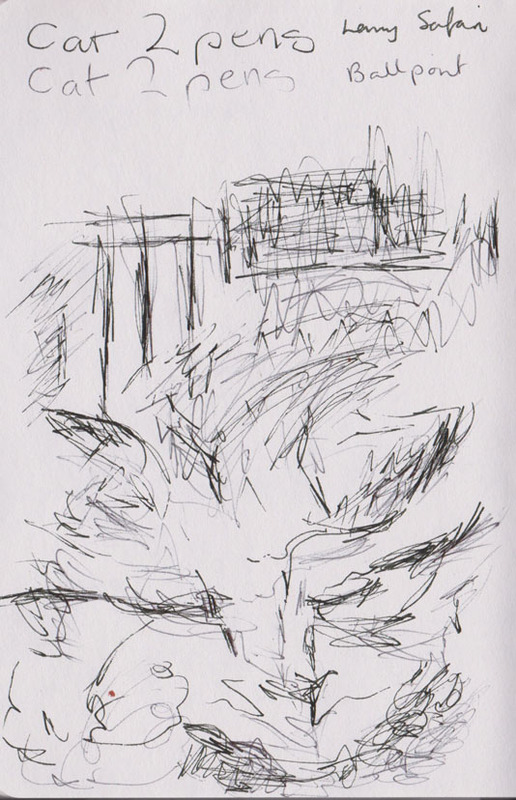 The upside of this, from a drawing perspective, was that he was in one space rather than moving all over his enclosure and that space was fairly close to where we could sit and draw. He also seemed interested in having some visitors to watch while he was waiting. There is no doubt that the head of a giraffe is more unusual than you might imagine. Can you see the head in your mind’s eye? Not only does a giraffe have two ‘horns’, or more correctly ossicones, on the top of its head, being a male this giraffe also had a well developed medium lump on the front of its skull – who’d a thought it! Luckily he was happy to demonstrate the flexibility of his lovely neck (unless you are being whacked by it). I found drawing the animal’s head was a challenge. It’s a wedge shape which appears way too wide at top for the overall length of the head and the very narrow, chisel shaped lips designed for grasping at leaves and other food. In fact it was so hard to draw that I had to excise one drawing which appeared to demonstrate a direct anatomical link between the giraffe and the Loch Ness monster. Not flattering to the giraffe at all. In all we spent over 4 hours at the zoo and I can see that this is yet another fascinating place to visit, for the purposes of drawing. I’m really pleased that the Zoo has a Friends of the Zoo membership so I will be encouraged to go back whenever I like. We spent yesterday at at Surf Beach near Bateman’s Bay, on the NSW South Coast, just under two hours drive from Canberra. It was our first official swim of the summer and we plan to make a few more trips over the coming weeks. It all sounded so easy until I put my brush to the page. My first few attempts were dodgy to say the least, but I did like the umbrella, fluttering in the breeze. OK moving right along, I started my second page. I seemed to be getting the hang of it. This time I quite like some of the figures. I have however, cropped the page, thereby sparing you from one of the most heinous landscapes I’ve painted in recent times. By my third page I felt I was starting to get the hang of the process. I’ll keep working on this approach as it yields good results. These works display Quilty’s characteristic large slashes of paint and this completely ‘works’ with the intensity of his subject matter. What is quite unusual is that Quilty asked the men and women who sat for their portraits to pose naked, to show what the body is like after it is stripped of its uniform and body armour. 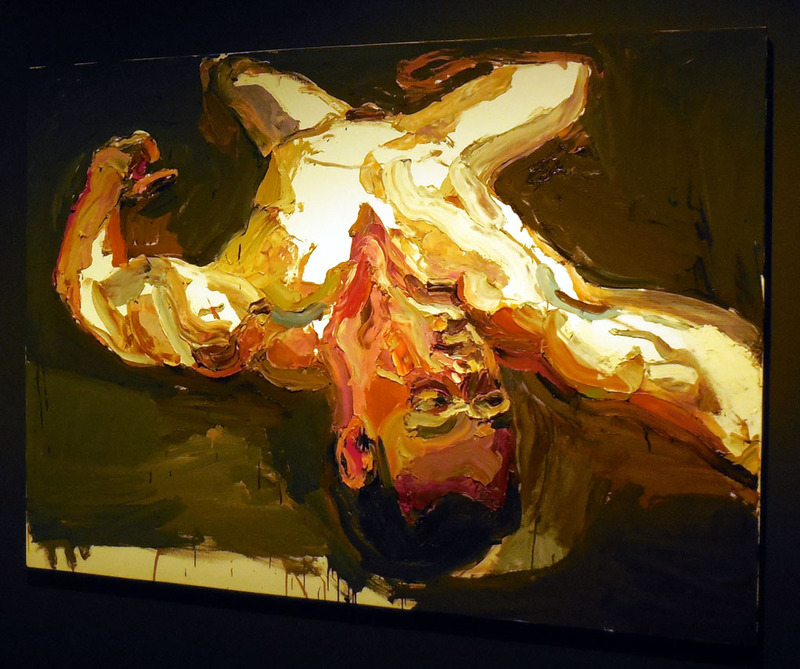 They were also asked “to select a pose that reflected an aspect of his or her experience. Some of them drew on an actual event from their deployment, others on the tiredness or the emotions they felt after their return to Australia”. The results are dramatic and almost emotionally too intimate in their outcome. 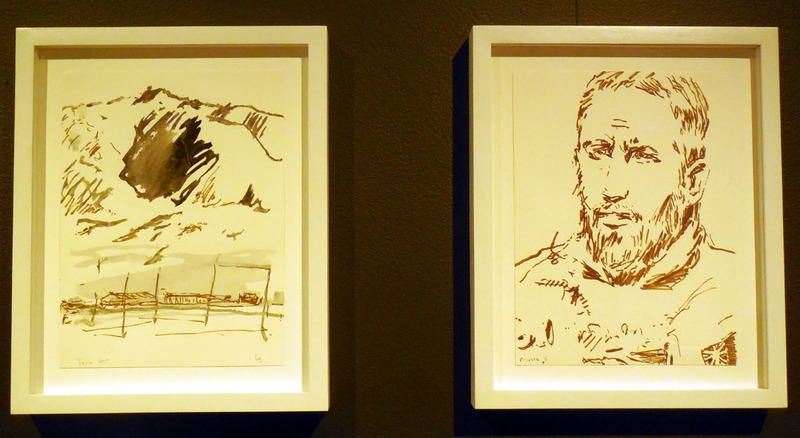 Given the intensity of these works it came as some relief to be able to step backwards and look at some of the sketches that Quilty made during his actual time in Afghanistan, including these two. As a sketcher I’m always interested in seeing what other artists draw. I also think that these straightforward works are a great tonic for many people I meet who, when starting to sketch, are overcome by the feeling that their drawings aren’t ‘good enough’ and are consequently of little value. Quilty shows that drawings don’t have to be massively refined to be effective. It’s enough to capture what is of interest to you. PS please excuse the poor colour quality, as these were taken without flash. 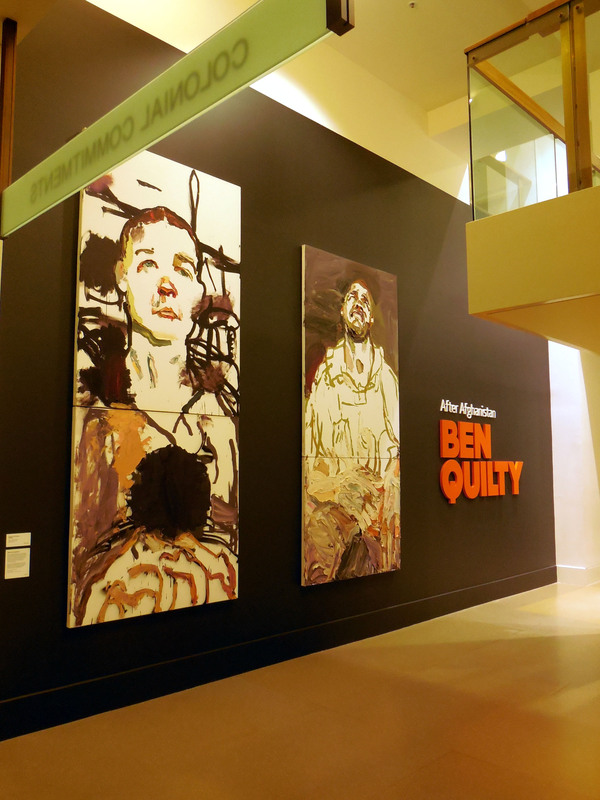 More colour-accurate versions of this exhibition can be found at Ben Quilty’s website. St John’s Church (or more correctly the Anglican Church of St John the Baptist), was consecrated in 1845, making it the oldest building the in area of Canberra city, (the city didn’t really take off until the decision was taken to make it the site of the national capital in 1908). The church and the associated school house are listed on the Register of the National Estate. 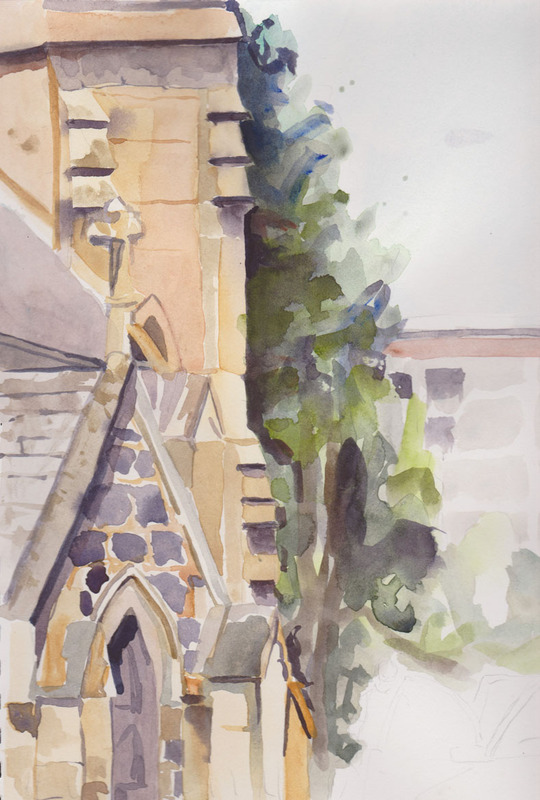 The view of my painting is of the northern side of the church (built between 1841-45) towards the spire (which was demolished and then rebuilt between 1865-70). The sandstone for the main part of the church was quarried from Black Mountain and also near the current suburb of Yarralumla. The side chapel, is built in the local ‘bluestone’ (or Dacitic ignimbrite to be geologically accurate), from nearby Mt Pleasant. The strong summer sun cast some dramatic highlights on the golden sandstone of the church. I really enjoyed ‘allowing’ myself to take the time to make a watercolour study, rather than the relatively quick sketches I’ve been making recently. I must do it more often.